Still Unbeatable records from Germany sent these over to review and I was particularly interested in the fact that they sent me both versions of the same record. To me, that shows there's a decent chance they might actually read this website unlike a lot of other records that randomly get sent over to me. I especially like the Japanese cover variant, but the music doesn't live up to expectations. Honestly, I'm not sure exactly what I was expecting. 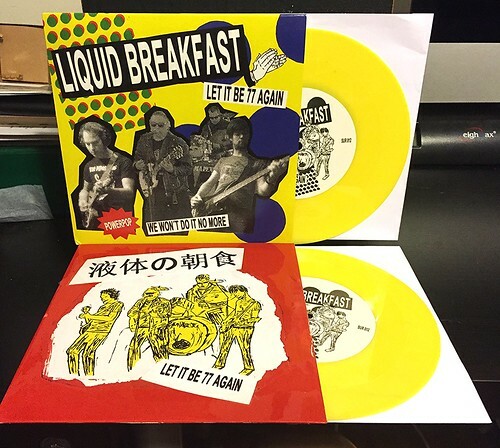 The 7" is called Let It Be 77 Again after all. But this doesn't feel like a tribute to a time gone by, it feels like a hokey grab at fleeting memories from someone that can't move on. I will be the first to admit that I have no idea who anyone in this band is, so if they're former members of some really important, yet obscure power poppers from the past; they're too obscure for me to know. There is a lot that bugs me about this record. The singer sounds like a cartoon leprechaun. The lyrics for "Let It Be 77 Again" are cliched at best and silly at worst. The dual layered lead guitars on B-side "We Won't Do It More" sound like they were pulled out of the worst Castlevania game imaginable. It's as if this band had the recipe for a couple of good songs, but then dumped in all of the wrong ingredients. If you really, really like everything and anything that sort of sounds like power pop and came out in the late 70's or early 80's or if you're just a gigantic fan of Lucky Charms cereal, it's possible you might dig this record. Personally, I don't like marshmallows very much. Or this record.